Items are listed in date order. To place an order, please refer to the bottom of this page. Most of my stock is surplus from my collection, consequently if an item is not listed, I do not presently have it in stock. However, these lists are regularly updated; make sure you visit stamps.chrisdehaer.com.au/shop for the latest price lists. All items are carefully packed and are supplied with descriptions were necessary. Please note, that due to the size of some items, extra postage may be required. All orders above $30 will be sent via registered or insured post. I will advise the cost of postage when confirming your order. Prices subject to change without notice. All prices are exclusive of GST. GST is not applicable. Set of five self-adhesive stamps from booklet. Semi-imperforate miniature sheet first day cover. Extremely scarce. Not officially released by Australia Post. 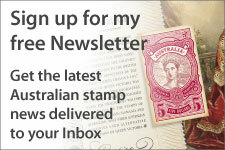 Please e-mail me first (at stamps@chrisdehaer.com.au) to confirm the availability of these stamps. Please quote the reference number(s) and your postal address. All orders over $30 are sent by registered/insured post. Postage is charged at cost. I will advise the cost of postage when confirming your order. All payments must be made in Australian dollars only. 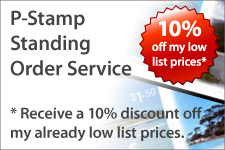 I do not extend credit, offer an approval service or send stamps cash-on-delivery. For Australian customers only, funds may be sent by cheque or money order (made out to "Christopher de Haer" and sent to PO Box 1448, Booragoon WA 6954) or deposited to my bank account with the National Australia Bank in Australian dollars only. Bank account details will be advised by e-mail. Paypal is not accepted for Australian orders. International customers may pay by Paypal or by international BANK (cashier's) cheque or draft denominated in Australian dollars ONLY and payable at an Australian Bank. I do not accept credit cards (except via Paypal for overseas customers). Stamps are not accepted as payment. All goods sold by me remain my property until paid for in full by the customer. Images are copyright their respective postal administrations and are included here for information purposes only. Catalogue numbers are copyright their respective catalogues and are included here for information purposes only. Unless otherwise indicated, the content of this website is © 2009-2011 Christopher de Haer. Permission is granted to copy this document in print as long as a reference to this website is given, and you are not selling it or using it as part of a product or service that is sold (whether for profit or not). On the World Wide Web, you must link here rather than put it on your own page. 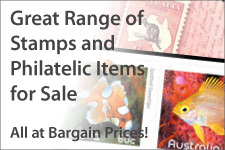 All stamp and philatelic product images are reproduced with kind permission of Australia Post, for the interest of collectors. Last updated 30 January 2011. Website comments and queries to stamps@chrisdehaer.com.au or PO Box 1448, Booragoon WA 6954.